"Fermat had not gained his high position through any particular ambition or accomplishment. He achieved it the old-fashioned way, by moving up steadily as his superiors dropped dead of the plague." From "The Drunkard's Walk: How Randomness Rules our Lives" by Leonard Mlodinow. 2008. Photo of Pascal just for the heck of it. But how did he come up with that last theorem of his? Did he really prove it or was he full of hot air? Let's hear it for the plague! Sandi: Yes, terrifyingly, there is apparently a 1 in 4 chance of McCain dropping dead in the next four years. 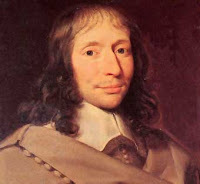 Fermat? I prefer Ferment. He was huge in beer production, I hear. So, am I right is thinking that proves the old "slow and steady wins the race" thingy? The tortoise and the hare story also proven? Well, okay, the plague aspect does help it a bit.